Experience the best high performance cloud hosting. ServerMania Cloud Servers ensures the security and availability of your mission critical data. 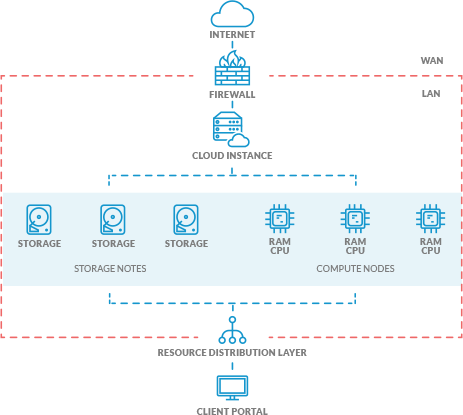 Shared infrastructure cloud hosting platform. Rapid scaling, deployment & decommissioning. Custom cloud servers tailored to your business. Comprehensive control, isolation, and privacy. Optimal for high performance infrastructures, business critical workloads, specialty hardware or configuration requirements, governance or regulatory requirements. NEED HELP FINDING THE BEST CLOUD SERVER HOSTING? One of the major benefits of cloud servers is the ability to increase CPU, memory, and disk resources instantly. This means you only pay for additional resources when you need them, reducing operational costs significantly. Full server, storage, and backup redundancy with automatic failover lets us confidently guarantee 100% availability on the best cloud server hosting platform. All of which are backed by our 24x7x365 north-american support team. Cloud Hosting allows you to instantly add or remove servers as needed for complete scalability. This ensures your online services function optimally by giving you the ability to automatically add servers when demand is high, and remove servers when demand decreases. This is the perfect option for those looking for setup assistance, but would like to handle the bulk of cloud server management themselves. We'll manage migrations, backups and proactively monitor your cloud server hosting 24x7 to ensure every aspect of your server is regularly running smoothly. Harness the power of OpenStack for fast server deployments and no-stress server management while paying less than with a traditional cloud vendor! Sleep easy in the knowledge that your company's vital infrastructure is in the best hands. Our zero downtime platform with proactive uptime and cloud server performance monitoring means no more late-night dashes to the data center. Learn how experts use the cloud. Learn 6 Secrets to Building a Successful Cloud Infrastructure.